While out shopping for a birthday party gift, I found myself wandering around the store looking at… everything. 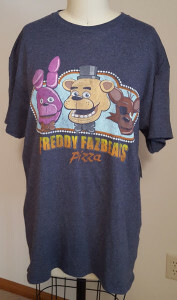 I stumbled across a men’s t-shirt for Five Night’s at Freddy’s (one of Easton’s favorite computer games). 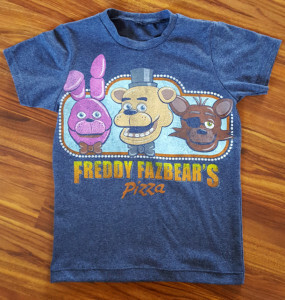 Chances are this theme will never make into kids sizes so I snagged the smallest size (a men’s large) and decided that I would shrink it down into something he could wear. For this recon, I used Jalie 2918 (view A). 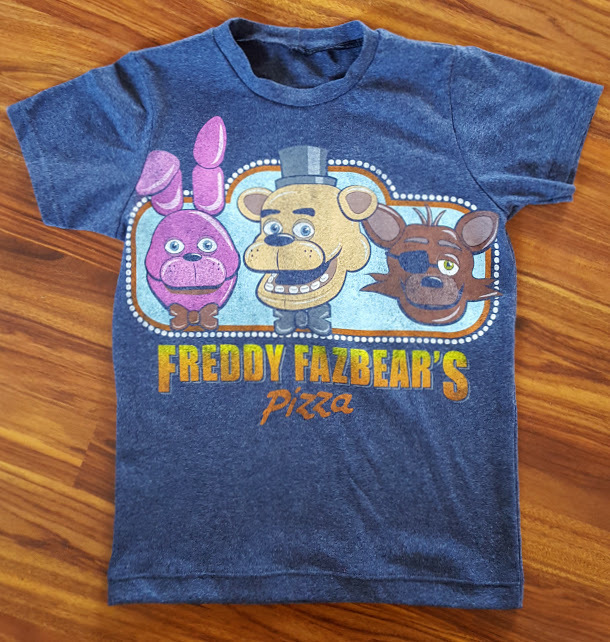 Because the logo of this shirt was so large, I had a hard time getting it to fit entirely on the smaller shirt – consequently, a bit of the ear got cut off, but I think it still works. To make this sew go a bit quicker, I kept the original sleeve hems (I used the sleeve pattern for his shirt size, but omitted the hem length so it wouldn’t be too long). Overall this was a fast sew with great results! This entry was posted in Uncategorized on January 29, 2016 by stacy. If concert and novelty tees are taking over your closet, don’t get rid of them. Transform them into an awesome looking quilt. Getting tired of your old sweaters? Transform them into cozy pillows instead. Keeping kids rooms neat and tidy is made just a bit easier with this bedside organizer. Learn how to create a designer looking handbag in an afternoon. 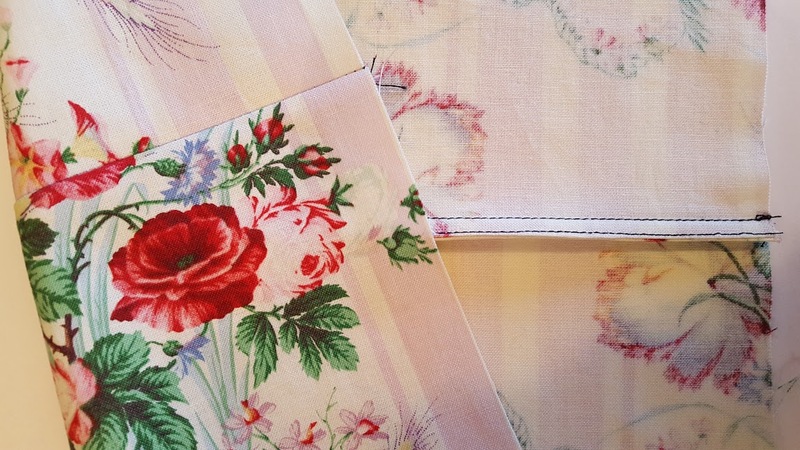 Proving that I need more time to sew…. Hot Pattern’s free Delta Hooded Vest. 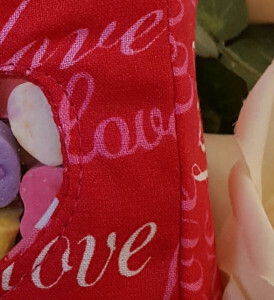 The most adorable backpack that’s perfect for Valentine’s Day. Looking for a (diaper) bag that stores all the necessities, but give you a ‘hands free’ option when pushing a baby buggy? Look no further than this adorable stroller tote. These drawstring bonnet baskets make a sweet Valentine’s gift, but they’re also a perfect storage solution as well. In last week’s Linky Thursday, I found a project to make large rag rugs…. This week I’ve found a much smaller version that I’ll definitely have to try – Braided Rag Rug Coasters! Learn how to ‘quilt as you go’ and show off some of your prettiest fabrics with this End to End Pillow project! Looking for a different take on the infinity scarf trend? Be sure to check out this Color Blocked version or this Frayed Edge tutorial that only takes 10 minutes to sew. This entry was posted in Uncategorized on January 28, 2016 by stacy. Yesterday I spent a bulk of my day cleaning up the instructions for “Mystery Project #3” and creating a final prototype to test my measurements. In the end, I wound up making a pretty darn cute final garment, but it’s a bit on the drab side (or it could just be me, I love pattern and color so much that I don’t do gray often). So, I’m thinking today’s goal should be adding some buttons and starting up the final project. In the mean time, I am LONGING to make something just for me! I think by the time I’m finished with all these “mystery projects” I’ll be ready to move onto some selfish spring sewing. This entry was posted in Uncategorized on January 27, 2016 by stacy. 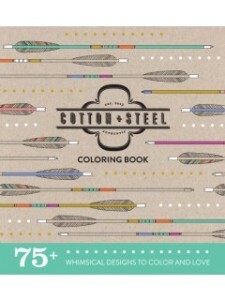 The popularity of adult coloring books prove that everyone loves to color. It’s not just stress relieving, but gives you a chance to express you creative side. Now, it’s even easier to take your coloring to a designing level with sewing pattern line drawings. More designers\companies are beginning to release images of their products so that sewists are better able to plan out their wardrobes and “test out fabric” choices without the commitment of stitching up the item. Currently, the only “big 4” company taking advantage of this trend is McCalls – who have released PDFs of their 10 Fall 2015 looks as well as a Spring 2015 booklet (you’ll need to enter you email address for you to be able to download the drawings). Independent designers, such as Betz White, have also created dowloadable coloring pages (you’ll have to join her Facebook Group to access the PDFs that appear under “File” at the top of the page) that are perfect for planning design elements on her bags. Not your style? Here’s a few from the 1960′s if you’re looking for a retro style. In the mean time, fabric designers continue to put out some awesome books that allow you to color in your favorite fabric prints. The latest to be released are the makers behind Cotton + Steel – ooooh, tigers and typewriters are calling my name! This entry was posted in Uncategorized on January 26, 2016 by stacy. Secret Project #2 is under way (it should be revealed sometime in May). I think, after several trial and errors, I finally have it looking the way I want it to and can start the process of making a final version, taking photos, and cleaning up the ‘rough draft’. In the mean time, here’s a little preview of what it will look like….. there’s even some hand stitching thrown in this one (which is a rarity for me) and some fun ‘hardware’ as well. This entry was posted in Uncategorized on January 22, 2016 by stacy. With Mother Nature showing a glimpse of spring last week by hosting some unseasonably warm temperatures, I decided that it was time to start pattern planning for the next season. 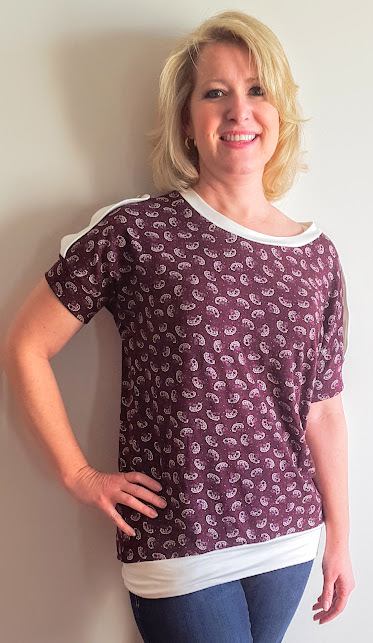 Consequently, for this month’s GoToPattern’s ambassador (affiliate link) sew up, I opted to stitch up Shwin Design’s Day Tripper Top. This is a quick-to sew dolman style top that can be made in long or short sleeves (with optional epaulets for the short version), optional pockets, and 3 different lengths. The fit is relaxed through the body with a fitted hip and the hem has a slight high\low design. For my version, I used an Elliott Berman print that I’ve been hoarding for ages. 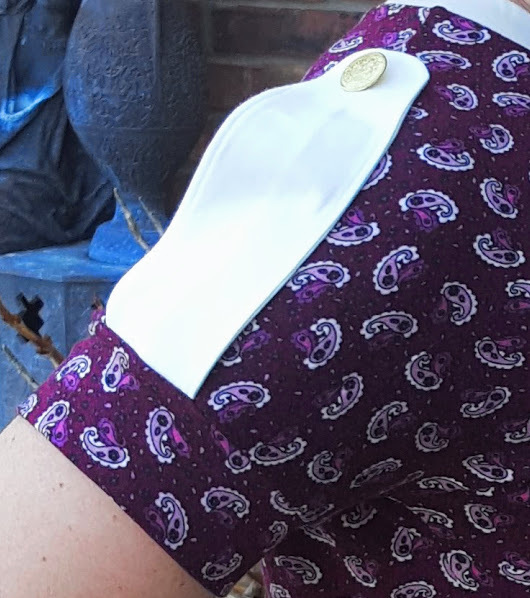 Since I went with the short sleeves (and very, very careful placement) I was able to squeek out this top with only one yard of fabric (I used a coordinating solid for the epaulets, neck and waist bands which also helped to reduce the amount of print I needed). Putting the Day Tripper together was a breeze – I was able to stitch this up in an afternoon and all the pieces went together beautifully. I had initially cut out pockets, but decided last minute to skip that step because I was afraid that the material would bunch up too much around my midriff… however now that it’s sewn, I’m sorry that I didn’t go ahead and add it in (because, POCKETS!). My favorite part? The epaulets! They definitely set this top apart from the others that I currently have in my wardrobe, plus it gave me a good excuse to sort through my button stash and find something fun to use. I’m sure you’ll be seeing a few more of these in the future from me…. as soon as Taylor saw this version she told me how cute it was (which means it will be missing from my closet soon)! This entry was posted in Uncategorized on January 18, 2016 by stacy. Valentine’s Day is right around the corner which means I’ve been working on an upcoming project for WeAllSew for the holiday. 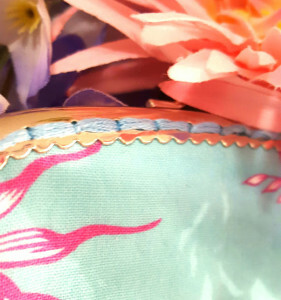 While I can’t show you the entire item I’ve been creating, I can show you a preview…. It’s little, perfect for gift giving, and should sew up in an afternoon. Hopefully you’ll enjoy sewing it up as much as I have working on it! Now to ‘polish’ up this project and get it ready for a Valentine’s release! In the mean time, I’m taking a bit of prototype sewing break and working on a little something for me. Keep an eye out Monday for a new (to me) pattern that I’m stitching up for myself! This entry was posted in Uncategorized on January 15, 2016 by stacy. Show the world your work. Make your own labels for your next project. The bean bag chair that only takes 30 minutes to make. Don’t forget to craft for your pets! This fleece tug toy is a great way to use up scraps from your winter projects. Keep all your cosmetic brushes in one place with this adorable organizer. Organize your sewing space by whipping up one of these mug organizer caddies , a few fabric trays, and a maker mat for under your machine! If hitting the gym was one of your New Year’s resolutions, then you’ll probably want to whip up a new duffle bag to take with you. No nightstand? No problem! Learn how to create an easy bed pocket to store all your night time essentials. Stop stepping on the back of your jeans. Learn how to put in a hem that looks just like the original with this quick video tutorial. Get ready for spring by whipping up one of these easy fit and flare dresses. This entry was posted in Uncategorized on January 14, 2016 by stacy.